A luxuriously crafted Tolkowsky I P1 diamond set on a beautiful 18ct white gold ring with a pear shaped halo of diamonds and sparkling diamond encrusted shoulders. The centre diamond is crafted using the innovative Tolkowsky formula in order to produce the finest brilliance, fire and scintillation, totaling 0.38ct. 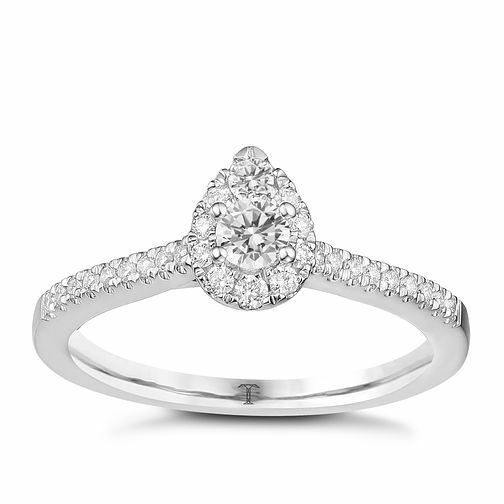 Tolkowsky 18ct White Gold 0.38ct Pear Halo Diamond Ring is rated 5.0 out of 5 by 1. Rated 5 out of 5 by Anonymous from This ring is stunning. Recently got engaged, and this was the ring. I can’t even begin to explain how beautiful this ring is, the way it glistens and the way it catches the light is simply beautiful. It’s elegant and classy and I feel so incredibly lucky to not only be marrying the love of my life, but to be the recipient of this beautiful ring.